It seems that all the major social media platforms have chosen to place video content and paid video advertising as their key focuses for 2017. With Facebook introducing auto-play sound to its videos on user’s news feeds, and Instagram starting to push live video across it’s stories feature, it is clear that video performs on social media. Twitter has an interesting relationship with video. As a predominantly text-based platform, video and image based content is a good way to stand out in a platform where content on users news feeds can change as quickly as it arrives. However, the relationship with video appears to vary a great deal. In the fourth quarter of 2016, Twitter and its advertising partners created over 600 hours of live video content from a total of 400 events. The company also saw a huge 31 million unique users tuning in for various types of content. In a recent report, the company broke down the content that made up these 52% of programming was about sports, 38% of programming was about news and politics, and 10% of live content produced was entertainment based (Live Q&As with film stars, live premiers etc). The report stated that 50% of the live video audience were under the age of 25, and over a third of total viewers came from outside of the US, despite a large amount of the content being based upon US news, sports and entertainment. These stats suggest that while Twitter may not be the first choice for video content from many advertisers, when it comes to news and sports content, it can be particularly powerful – especially for users outside of the US who have an interest in the current events and have no other means of watching live sporting events or presidential debates. Interestingly, 6.6 million hours of live video broadcasted by Twitter was also broadcasted through live video platform Periscope. Twitter continues to understand that live video content engages its users and gets them to tune in, the fact that the social media network has integrated user-generated livestreaming directly into Twittter’s flagship app suggests we could see a bump in these live video figures in the coming year. 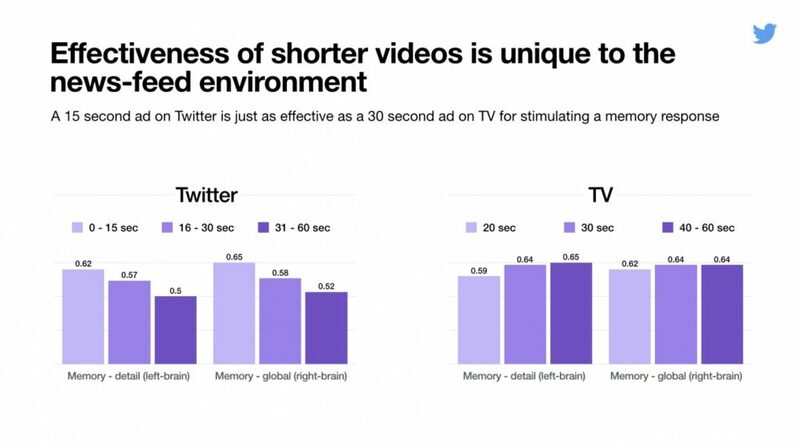 In addition to stats from 2016, Twitter has recently released a report undertaken in partnership with Omnicom Media Group to analyse the effectiveness of shorter videos on Twitter users. The test included 17 brands which advertise on twitter across seven verticals, and used neuroscience to measure brain activity as participants browsed their timelines. 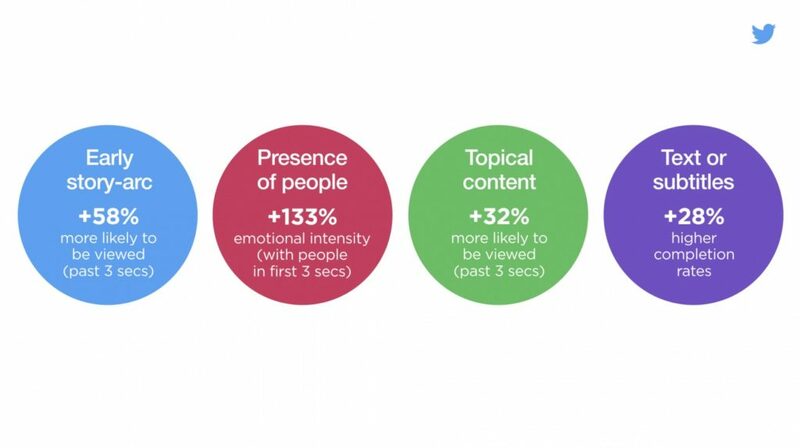 The results from this study are incredibly useful for marketers in knowing exactly what makes users engage with video content on the platform, and what they can do to improve both paid and organic content so it resonates with users. The survey found that videos on social platforms that are less than 15 seconds in duration are more likely to drive memory encoding, to a similar level of longer television adverts. In addition, the survey found that audio played an interesting part in the engagement and retention of videos on the platform. If a user briefly views a video, audio does not factor. However, if users watch a full video the study found those with audio had higher metrics than those without, and dialog had more of an impact on users than music. As well as this, the study found that a number of creative attributes caused individuals to stop and watch, including an early story arc within the narrative, the presence of people, topical context and subtitles or text on screen. So what does this mean for advertising? Firstly, it’s clear that by investing so much research into what actually resonates with their users that Twitter wants to keep this part of its platform as useful and powerful to users and advertisers as it can. Secondly, it is useful for advertisers to know what works and what doesn’t when it comes to creating paid advertising content, and whether or not video is the right medium to use on the platform. These metrics suggest that it could be, if the right boxes are ticked to appeal to users. What are your thoughts on video on the Twitter platform? Have you ever used its live video options? What is the Instagram Algorithm and why does it matter? One of the biggest challenges that many small businesses, bloggers and start-ups face when it comes to marketing their own content online via Instagram is the Instagram Algorithm. Dark Social Media – What is it? We delve into the mysterious world of ‘dark social media’ that could be driving up to 84% of traffic to your website.